Small volumes of anti-EAPP antibody vial(s) may occasionally become entrapped in the seal of the product vial during shipment and storage. If necessary, briefly centrifuge the vial on a tabletop centrifuge to dislodge any liquid in the container`s cap. Certain products may require to ship with dry ice and additional dry ice fee may apply. NCBI/Uniprot data below describe general gene information for EAPP. It may not necessarily be applicable to this product. EAPP: May play an important role in the fine-tuning of both major E2F1 activities, the regulation of the cell-cycle and the induction of apoptosis. 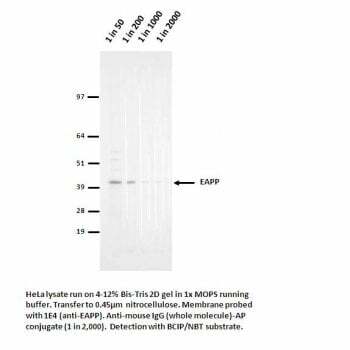 Promotes S-phase entry, and inhibits p14(ARP) expression. Interacts with E2F1. The C-terminal half binds the N- terminal of E2F1. Also interacts with E2F2 and E2F3, but not E2F4. Ubiquitously expressed. Highest levels in heart, placenta, skeletal muscle and pancreas. Lower levels in brain, lung and kidney. In the brain, expressed in all regions with high levels in the cerebellum and cerebral cortex. Expressed in COS1 and transformed skin fibroblasts. 1. Independently of EAPP, E2F1 also increases the activity of the MDR1 promoter.